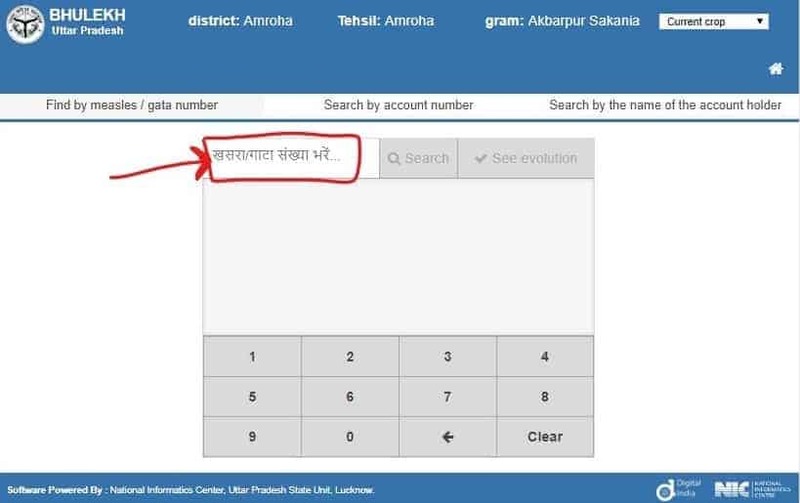 UP Bhulekh, Khasra, Khatoni, Bhulekh UP Online Verification 2019: Bhulekh UP is a digital portal for land records launched by the Revenue Council of Government of Uttar Pradesh. Before the introduction of Bhulekh UP, all the task related to the record of land such as Khatauni system, Jamabandi, etc. were done recording manually on papers. But now UP Government has computerized all the land record activities in the state. 2 How to check UP Land Records through Uttar Pradesh Bhulekh online? Check all the important information about Bhulekh UP in this article. Here you will get a detailed information about UP Bhulekh, its advantages, how to use it and other information. Bhulekh UP is an online portal that maintains the whole life of UP Khatauni and other land information. This computerized system is much organized and transparent than previous system. Every citizen can easily check information about their land record from their homes. They no longer have to head towards the revenue office, UP Patwari or any other concerned office for knowing a small piece of information. Bhulekh UP is an online portal of UP Revenue Board that has solved the problem of manual land records in the state. Uttar Pradesh Bhulekh is made up from two Hindi words i.e. Bhu + Lekh where Bhu means land and Lekh means details or account. UP Bhulekh means keeping the account/ record of a land. It includes all the description of a land, its owner and other information in detail. It has been implemented in all the districts of the state. How to check UP Land Records through Uttar Pradesh Bhulekh online? Bhulekh UP is an online portal and most of the people do not know how it works and how they can use it to check the land records. If you are one of them, then you do not have to worry. Here we have shared a step by step procedure to check the land records to help you in this. We have kept the language simple and easy to understand. You can easily follow the procedure and can get details of your land at your home. You can check the imitation of Khatauni (Khatauni ki nakal) on Bhulekh by following the procedure shared below. To make it easy for you we have explained the complete procedure with help of pictures. For this, you need to visit the official portal of Bhulekh UP i.e. http://upbhulekh.gov.in. On the homepage of the portal, you will various links. You have to click on “See imitation of Khatoni (rights record)” link. A dialog will appear and you have to enter the shown captcha code. Before you click on submit button, you must ensure that you have entered the code correctly as it is case sensitive. Now, you have to choose the district from the list as shown in the picture. 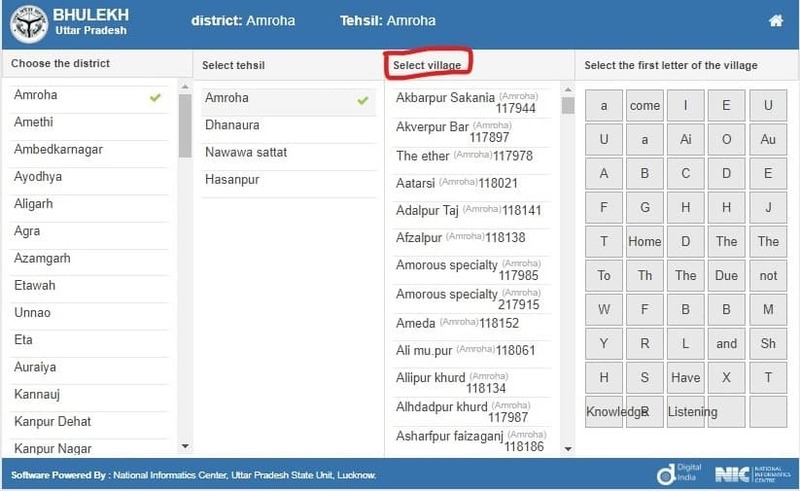 On selecting a district, a list of all the tehsils falling under that district will appear. You have to select the respective tehsil from the list. 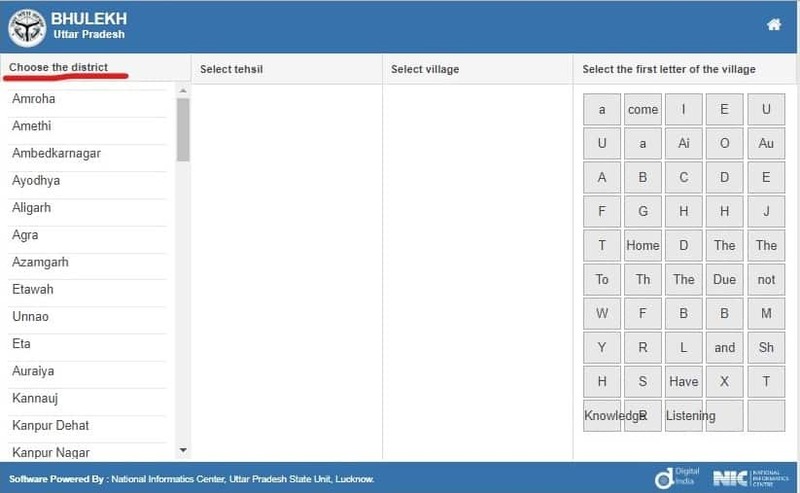 Once you have selected the tehsil a list of village will appear and you have to select your village. 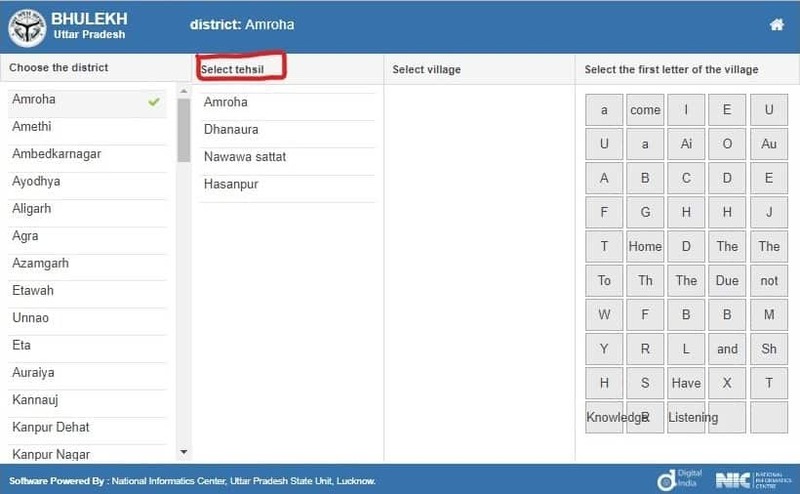 You can make it easy by selecting the first letter of your village from the option given below. Now you have to enter the valid information in the space provided. You are given three option to search. You can search by entering the Gata No./ measles or by account No. or by the name of the account holder. Now, you can see the details of your account on your screen. It includes information such as name of the account holder, crop year, district, area, land record number, order, area etc. Lastly, if you wish you can save the page or can take a screenshot for references. However, details about your land are already in the database and you can check it anywhere, any time when you need it. 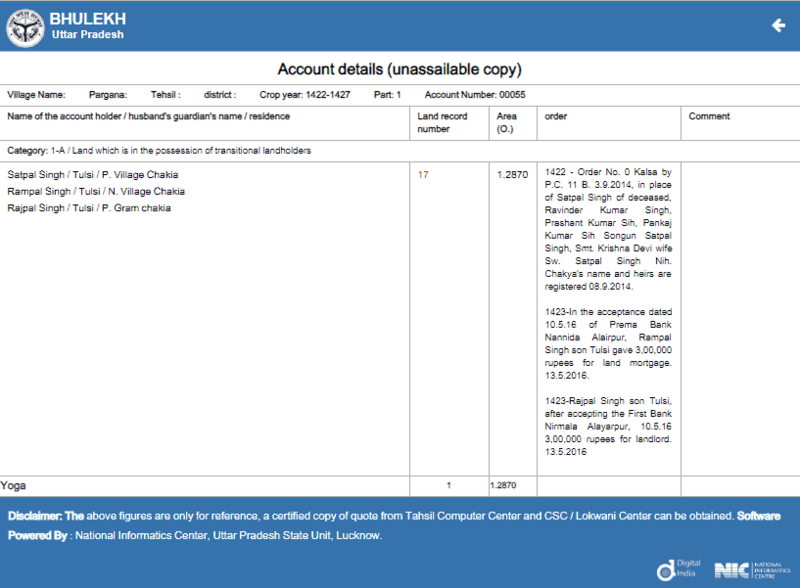 If you want to check other land records on Bhulekh UP such as code of revenue village Khatoauni, unique code of plot/ gate, status of plot, etc. records other than imitation of Khatauni you can follow the same procedure given above. You must have your Khasra or Gata Number to check the various record of your land. Without a valid Khasra Number, you cannot check your records. Earlier record keeping of land was done manually at the Revenue Board. Citizens have to visit the department for every task related to their land. For each and every task related to land such as sale of land, imitation of khatauni, unique code, jamabandi etc. They have to visit the govt. office for viewing even a single information of land account. It was very time consuming and sometimes did not give satisfactory results. But, now scenario has been changed and Uttar Pradesh government has computerized the land record system. All the activities and records of land of citizens in the state of Uttar Pradesh are now maintained with the help of information technology. Bhulekh UP is a web portal initiated by the Revenue Board of UP for keeping the records of land of the people. Bhulekh UP is an online platform through which you can know your unique code of plot, code of revenue village khatauni, status of plot, status of plot sale, rights record, duplicate fragmentation etc. Citizens can view date of their land records, land map and all the related information on a single website at any time and any place. They do not have to visit the concerned department every time. People can view their land details just by entering the Khasra No/ Gate no. on this portal. It is a transparent system that helps in reducing illegal possession of land, scuffles, grabbing of land of weaker sections, crime, lawsuits etc. Now citizen do have to visit the Revenue department for knowing the status or information regarding their land. They can check it just by visiting the Bhulekh UP portal. Earlier, it was hectic and time-consuming activity if you have to check the land records. Now with Bhulekh UP, citizens can save their time as they do not have to frequently visit the Patwari office. Citizen can add information and update their land account through Bhulekh. Citizen can also check the online map of Uttar Pardesh. UP Bhu Naksha 2019 link is provided here. Click on the link to visit the Bhulekh UP online map/naksha. Uttar Pradesh Geo Map Online: you can see a map of your own land farm online sitting at home. You can also take a printout of your land map. Uttar Pradesh’s Chief Minister Yogi Adityanath has introduced an online map of the country by making map material information online. If you any issue in online verification or in UP bhulekh online registration 2019, then you can comment below and we will reply to your problem ASAP. Keep doing the good work, Uttar Pradesh will become Uttam. Every individual who honestly working hard should be proud of taking one step closer to make UP as positive vibrant UP. i want toknow how to put vaad no for mutation. Bhulekh up web site not working have some problem last many days please look the defect matter and repair & update to gate and see land records . Sir, I want to know the unique code for my land in meerut. But the link which shows the unique code is not working. I want to sale my property. But without the unique code, i am unable to sell.